Patches the Hyena (Trusty Patches) is a Character in Dark Souls. Patches returns with his deceiving ways to trick you into losing your life and treasures, but will eventually sell you some good cleric gear and other useful items. 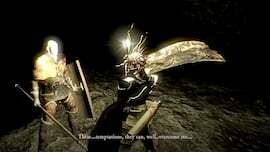 He is quite notable for having a strong distaste for clerics, And his counterpart in demon's souls had felt the same way for priests. In no way is this a way to connect the games, Just a nod towards its predecessor. If you venture down to the Catacombs before Reah and her company, Patches will appear in front of the lever for the second spiked bridge, close to the hidden bonfire. He will also be in the Catacombs if you have attacked or killed Petrus, or any of Reah's companions. When you cross the bridge he'll pull the lever, making it impossible for you to cross the bridge again, or you'll fall off if you haven't fully crossed it. He only does this once so you don't have to kill him in order to proceed. If you talk to him before crossing the bridge, he will still trigger the bridge while you are on it. Answer his cleric question with "No" to avoid him getting hostile later. Go back and talk to him after the incident, and he'll ask if it caused you any trouble. Answer "Yes", and he will bribe you with one Humanity item. If you didn't talk to him before the bridge incident, he will play innocent and bribe you with a Soul of a Lost Undead when you confront him. He will not ask if you are a cleric either. Patches will change location to the Tomb of Giants after you finish off Pinwheel in the Catacombs. He appears soon after the first bonfire you encounter. He will talk to you and push you down a hole. Getting pushed into the hole in the Tomb of Giants is actually favorable to you, as that is where you get the Skull Lantern, and meet Reah, so forgive poor patches and praise the sun that you have an item that makes it easier to see more than a foot in front of you. If it's your first encounter with him, or if he bribed you with a soul in the Catacombs, he'll ask if you're a cleric before kicking you down. Answer "No" to avoid his hostility when you get back out of the pit. If you walk straight past him to the ledge he will still kick you down. When you get back out of the pit he'll ask if you are cleric, if you say yes he will become hostile, so answer "No". If you already met him in the Catacombs, and he asked for forgiveness, the events are much the same, but he won't ask the cleric question since he already did that in the first encounter. When you climb back out of the pit, go talk to him and he'll ask for your forgiveness. If you choose not to forgive him he will bribe you with a Twin Humanities, and will begin to laugh. Proceed through the level and kill Nito to make him appear in Firelink Shrine as a merchant. Using Dark Hand, you can drain around 7 Humanities. Possible Glitch: After Patches asks if you forgive him for kicking you down the hole, if you forgive him and immediately kill him, he'll still appear at Firelink and offer to sell you stuff. Patches might be a bit bugged in general, people have reported that they had to go back down to Tomb of Giants and kill him to make him show up as a merchant. (Doesn't appear after killed. Confirmed. Bug: After defeating Nito and returning to the Tomb of the Giants,in the same spot he throws you off into a pit, items are dropped. They can be picked up and will be the items he drops after death, it is unknown the way of which he died and if you return to Firelink you will not find him. Bug: If you kick Patches down into the hole with the "treasure" before going over to the ledge, the cut scene will still occur if attempted and Patches will respawn back up top. Patches is a recurring character of the series. He carried the moniker "The Hyena" in DeS, "Trusty" in DS1, "The Spider" in Bloodborne, "Unbreakable" in DS3. In DS2, Patches' character was replaced by "Mild Mannered Pate", who fulfilled the same treacherous archetype. I haven&apos;t gone into the Tomb of Giants yet. When I went through the Catacombs he was not there for me at all. Even before I killed Pinwheel. Will he still be in the Tomb of Giants? Does he still appear in the Tomb of Giants if you&apos;ve killed the clerics before meeting him? What happens if you kill Pinwheel before meeting Patches? Where would he be? If it is the same patches, how old is he? After Patches relocated to the Firelink Shrine, I used the Dark Hand on him (for his last remaining humanity. I took 6 humanity from him in the Tomb Of The Giants), he then became hostile and now, won&apos;t sell me anything. Can I be absolved and proceed to buy from him again? What happens if you just immediately kill him, without speaking to him. What happens to Reah and company? What gesture does he teach you? I&apos;ve never had him as a merchant and I saw in someone&apos;s playthrough that in Firelink there&apos;s an option to learn a gesture that shows up when you talk to him.